Sign up for Broadjam today to follow Crosseyed Miles, and be notified when they upload new stuff or update their news! Amazing "story you can see with your ears" about a man & woman who fall in love & they live happily ever after. Nice song. The vocals are great. The guitar tone is real nice. The lyrics are really good, nice story line. The mix is really good. This song has really good dynamics. Great song Keep up the good work!!! BLUE SUNDRESS WITH FLOWERS THAT STOPPED YOU TO STARE. SCENT OF DAISIES AS SHE WALKED BY. OOOH, SHE WALKED ON BY. BUT YOU BREATHED OUT SADNESS AS YOU TOOK HER IN. WELL I ASKED HER TO DANCE, AND SHE SAID "LET'S GO". HELD ON TIGHT AS WE FLEW 'CROSS THE FLOOR. OH, YOU KNOW, AND I STILL REMEMBER. WELL, SHE HAD CLASS WITH A...LITTLE BIT OF SASS AND I, HAD TO MAKE HER MINE. LOVE HER MORE NOW THAN I DID THEN. THE NIGHT THAT CHANGED MY LIFE. Thanks for supporting Crosseyed Miles! 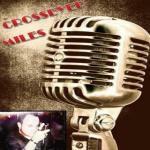 Would you like to help Crosseyed Miles get heard by industry pros by buying them a song submission credit to Broadjam Music Licensing Opportunities?